During 12.12 Sales, Machines Malaysia Screwed Up. Here’s What People Are Saying. On December 12, Machines held their widely promoted “12.12 Online Sale”. Touting discounts of up to 80%, the sale opened to fierce hype and huge demand. MacBooks, iPhones, and Apple Watches were among the hot commodities on offer, with slashed prices offering savings of more than RM1k on some products. However, as with all online sales, the most popular products were snatched up instantly; some shoppers claimed MacBooks and iPhones sold out under 4 minutes. The problems began when buyers started complaining of overselling on the side of Machines. 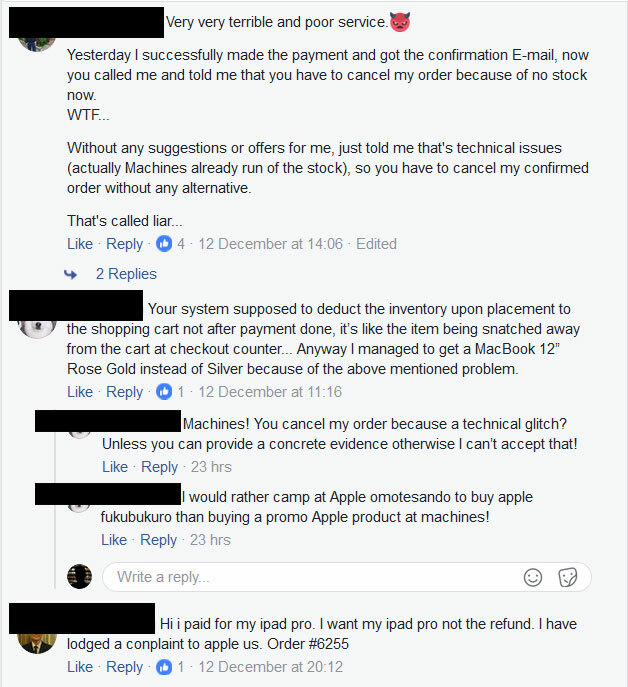 Many commented on the original FB post announcing the sale, saying they received phone calls from Machines representatives who apologised for not being able to deliver the products as promised, offering full refunds instead. This came after the customers had made the orders, had the payments deducted from their credit cards, and received confirmation emails of purchase from Machines. As expected, this did not sit well with the customers and outrage ensued. Taken from the Machines Facebook page. Customers vented their frustrations at Machines’ poor handling of their inventory system and subpar checkout system, while others even went as far as calling the sale a scam. Furious at being denied what they were promised, some even stated their intentions to lodge official complaints to the authorities as well as Apple themselves. Two individuals who made failed purchases during the sale reached out to us to share a snippets of emails they received from Machines representatives. Ultimately, customers were left disappointed after being let down by a reputable brand, with some calling Machines out for false advertising and using the sale as a shady marketing ploy. And as if to stoke the fire, Machines was also called out for deleting posts in an attempt to reduce customer discontent. 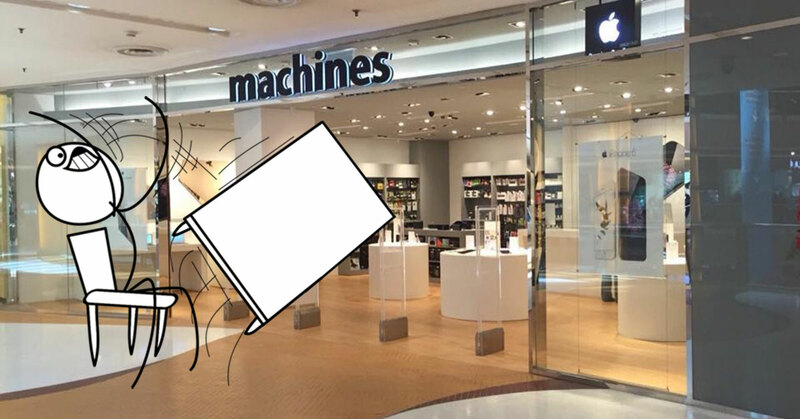 At the time of writing, Machines has yet to release a statement in response to public dissatisfaction surrounding the online sale. But it’s clear that the damage has been done. Such incidences similar to this one have occurred before, and only offering a refund on a failed product delivery is the bare minimum that a company can do to right their mistake. In an age where so much has been said on how to handle marketing correctly, it’s perplexing that companies are still making the basic mistakes. Possibly the biggest the lesson learned from this fiasco is that customers will never settle for less than what has been promised, and so to deny large amounts of people their purchases is tantamount to disaster. Additionally, it’s also concerning of all is that this misstep comes from a highly reputable re-seller of some of the most popular digital gadgets in the world. We’ve reached out to Machines for their comment and will update this space if they reply.